Expositio: The poem was written after cable swims at Foster Lake in 2015. I had a discussion on the beach with a fellow swimmer who had a PhD in English Literature and whose thesis was on T.S.Eliot. 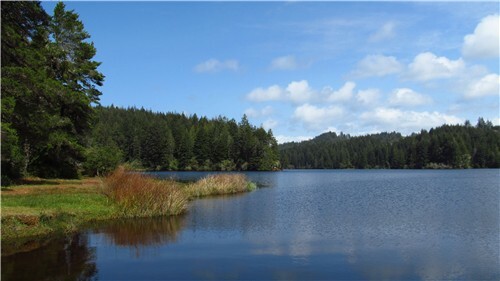 Having read Eliot’s “Four Quartets” in a seminar once, I was caught by the poet’s use of time, and I tried to apply the motif to swimming up and back the west arm of Eel Lake on the Oregon coast near Coos Bay. Time for open water swimmers disappears. Distance, duration and place measure time. Of the west arm. How long you ask? And more when swims are measured by a clock. We can see the sun higher above the hills. Train transported trees two or three cuts ago. Of the swim, repeating the distance gone. Is measured by stroke and heart beat. With their lives, season short or glyphosate. Around and swim for where we began. In the sand of the beach. The clock is complete.